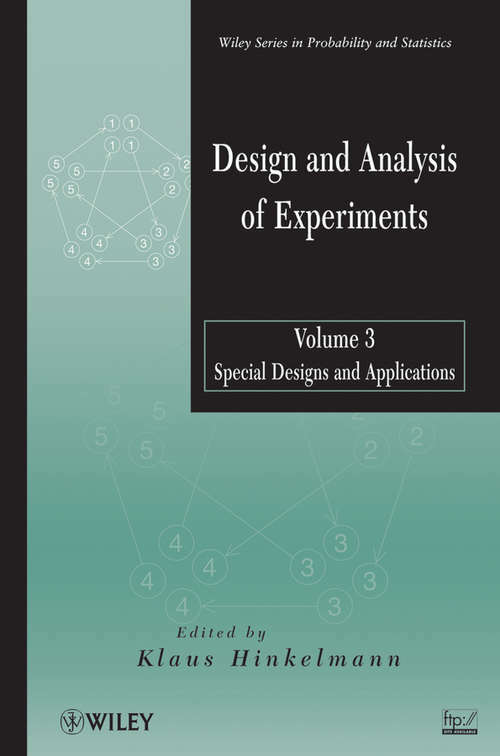 Provides timely applications, modifications, and extensions of experimental designs for a variety of disciplinesDesign and Analysis of Experiments, Volume 3: Special Designs and Applications continues building upon the philosophical foundations of experimental design by providing important, modern applications of experimental design to the many fields that utilize them. The book also presents optimal and efficient designs for practice and covers key topics in current statistical research.Featuring contributions from leading researchers and academics, the book demonstrates how the presented concepts are used across various fields from genetics and medicinal and pharmaceutical research to manufacturing, engineering, and national security. Each chapter includes an introduction followed by the historical background as well as in-depth procedures that aid in the construction and analysis of the discussed designs. Topical coverage includes:Genetic cross experiments, microarray experiments, and variety trialsClinical trials, group-sequential designs, and adaptive designsFractional factorial and search, choice, and optimal designs for generalized linear modelsComputer experiments with applications to homeland securityRobust parameter designs and split-plot type response surface designsAnalysis of directional data experimentsThroughout the book, illustrative and numerical examples utilize SAS®, JMP®, and R software programs to demonstrate the discussed techniques. Related data sets and software applications are available on the book's related FTP site.Design and Analysis of Experiments, Volume 3 is an ideal textbook for graduate courses in experimental design and also serves as a practical, hands-on reference for statisticians and researchers across a wide array of subject areas, including biological sciences, engineering, medicine, and business.